The holidays are technically over – but don’t let that stop you from stepping back into the magic of Christmas at Wonderland Express. Watch model trains roll past miniature Chicago landmarks, like the iconic Chicago Theater, and a gingerbread village while the snow falls around you indoors. Be sure to catch ice sculptors as they chop, carve and chainsaw blocks of ice into works of art (11 a.m. and 2 p.m. Saturday and Sunday). BYO binoculars and cameras to Eagle Watch on the River, where you can catch a glimpse of bald eagles and other wintering birds as you stroll along the Des Plaines River. Some binoculars and spotting scopes are available inside the Four Rivers Environmental Education Center. While inside, grab a complimentary hot drink, learn more about eagles and watch a screening of PBS’ “American Eagle” (shown at 10 a.m. and 1 p.m. each day). Organizers advise dressing for the weather and use caution while walking outdoors as snow and ice may be present on paths and parking areas. Raise a glass or Mason jar to fermented tea at Kombucha Brewing 101. During the 1.5-hour workshop, Kombuchade founder and brewer Matt Lancor aims to teach you everything you need to know to start brewing your own. Bonus: you’ll be sent home with a kombucha SCOBY, starter liquid and recipe to jump-start your new hobby. Start 2019 with a whirlwind romance at New Year Speed Dating, where you can mingle with single men and women ages 28-42. How it works: Ladies will stay seated the entire time while the fellas will rotate every 5-6 minutes. Don’t worry about getting tongue-tied – icebreakers will be provided, as well as food and wine. Matches are notified within 48-72 hours after the event via email. Discover the talents of Chicago youth at the 32nd Young Playwrights Festival. Presented by Pegasus Theatre Chicago, a trio of one-act plays written by Chicago high school students will be performed, with topics addressing sexual orientation, violence and family obligations. Teddy bears, dolls, airline tickets and diaries are among the items brought to America by survivors of the Holocaust and other genocides. More than 60 such personal artifacts are displayed in the exhibit “Stories of Survival: Object. Image. Memory.” Each artifact is showcased alongside oversized photos by documentarian Jim Lommasson with a handwritten note detailing the item’s significance by the survivor or their family member. 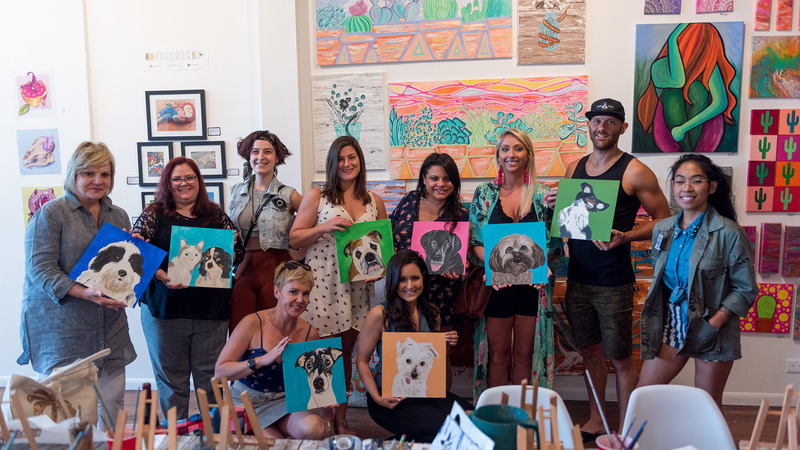 Tap into your creative side at Paint Your Pet & Sip. Create a one-of-a-kind portrait of your fur baby while supporting Chicago Canine Rescue. Don’t consider yourself much of an artist? No problem. Email a photo of your pet before the event to organizers who will trace your pet’s photo onto a canvas – all you have to do is paint. A wealthy businessman is dead, his wife is seriously injured and police think she killed her husband before turning the gun on herself. Can you figure out whodunit in The Sherlock Holmes at the Art Museum Scavenger Hunt? The game, based on a Sherlock Holmes story, incorporates artworks at the AIC and strange dancing stick figures. Create your very own hand-dipped Beeswax Candles. Adults and families with children ages 8 and up are invited to participate. Registration is required at 312-744-5472. Reach new heights with Acro Yoga, a partner practice that seeks to engage both the body and mind. Yoga poses and acrobatic conditioning are used as a warm-up to build into a partner acrobatics practice that focuses on the enjoyment of physical activity. Events listed are subject to change. We recommend double-checking times and locations before you head out the door. Want to share your upcoming events with us for consideration in a future roundup? Send us an email.